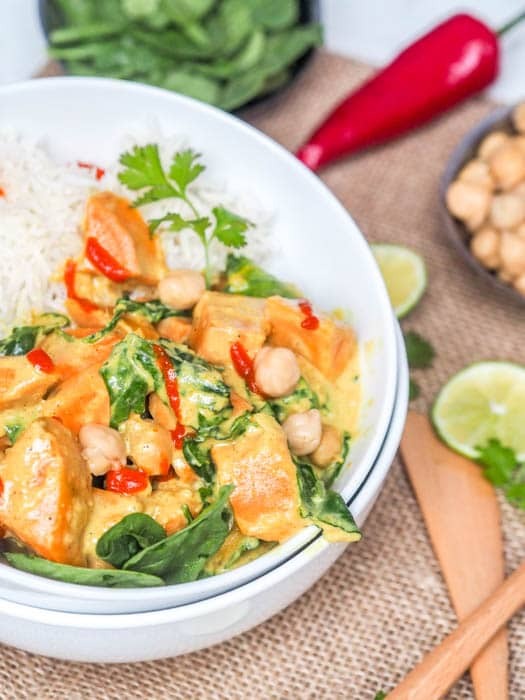 Butternut squash curry that’s creamy and fragrant with spinach, chickpeas, coconut milk and red curry paste. Secret ingredient in the recipe makes the sauce extra creamy every time! Strong and vibrant flavors of lemongrass, ginger and tamarind really bring this Thai flavored dish to life. Vegan and Gluten Free. Butternut squash curry is what I’m currently craving. D and I recently crossed into country number 57 – Bulgaria and there is no Thai food in sight. I mean there are barely any Asian style restaurants in this country – Chinese I have seen, but I’ve seriously got Thai food on my mind. I always love a rich, deep and vibrant Thai based curry. Before spending three months in Thailand I wasn’t even familiar with all the different Thai curries. I always just ordered a standard Pad Thai when I went out for Thai food. Once in Thailand though, I went curry crazy. I loved all the different curry pastes, from red to green to penang to massaman. I loved them all. Now, as I have discovered not all curry pastes are created equal. I have tried all sorts of brands of curry paste available in the US and there is no doubt that the Maesri brand comes out on top. This one tastes the most like fresh home made curry paste in Thailand though the spice level is up there so don’t add a lot if you can’t stand the heat! A good Thai curry starts with the curry paste so make sure you always pick a good one, or make your own from scratch. And coconut milk is like liquid gold if you ask me. 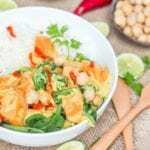 It’s so rich and creamy and incredible mixed in with the curry paste flavors along with freshness of lemongrass, limes, ginger, garlic, red onion. It’s simply the best. I had made a squash red curry before but this time I wanted to jazz things up a bit and take the dish to the next level, so a vegan butternut squash curry was just what I needed. 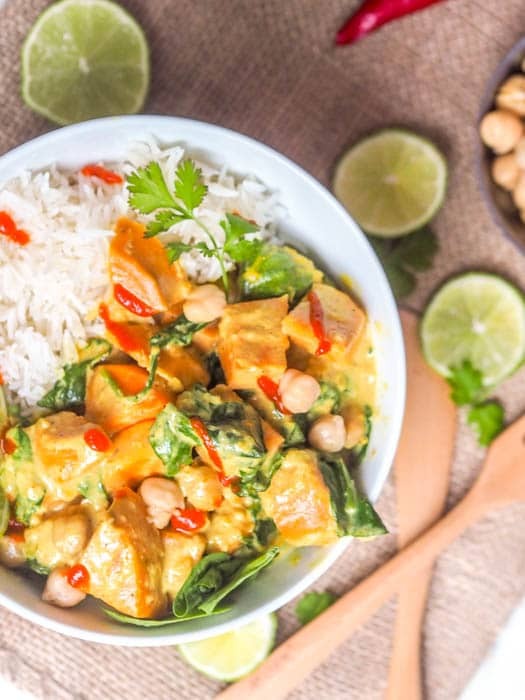 With the help of spinach, peanut butter and tamarind in this butternut squash curry recipe, that has most certainly been achieved. 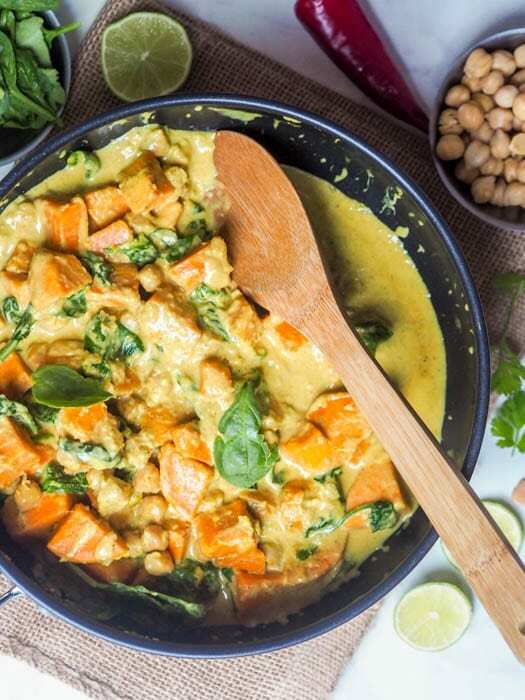 The peanut butter, even just a tablespoon completely elevates the flavor of this butternut squash curry. It just makes the sauce slightly nutty and even more creamy than with just the coconut milk alone. The tamarind gives it a bit of a sour flavor, think of tamarind as one of those war heads candies from the 90s. Remember those? So a little bit of tamarind goes a long way to give the dish that special uumpth of flavor. Not to worry though, if you don’t have access to tamarind you can omit it from the recipe. It still works, but I do recommend you buy a block of tamarind online so you can add just a hint of it here and there. The heart of this recipe is the soft and delicious butternut squash. It just soaks up all those rich Thai flavors. For additional plant based protein I added chickpeas and for superfood uber healthy addition we’ve got spinach. The spinach also lightens up the heaviness of the curry a bit. Oh and did I mention that this vegan butternut squash curry is also gluten-free? Perfect for a meatless Asian themed superfood plant based dinner meal. 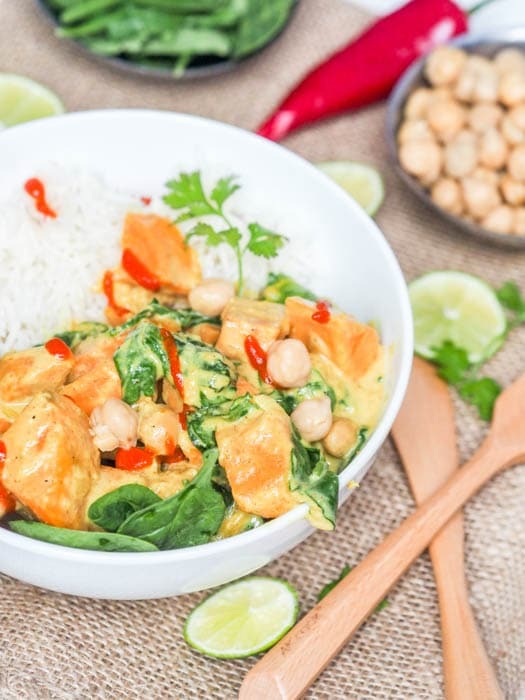 A vegan and gluten-free creamy and fragrant butternut squash curry with spinach, and red curry paste. Strong and vibrant flavors of lemongrass, ginger and tamarind really bring the flavors to life. Bring a pot of water to a boil and add the squash. Cook for a few minutes until squash is tender when pierced with a fork. Drain and set aside. Soak tamarind in three tablespoons hot water for a few minutes. Squeeze the tamarind and rub it with the water to mix it up. Heat coconut oil over medium heat in a pan and add red onion, ginger, lemongrass and garlic. Cook for a few minutes until fragrant. Add red curry paste and cook for 1-2 more minutes. Add tamarind paste (discarding the fibers) peanut butter and fish sauce. Mix. Add one third of the coconut milk. Bring the sauce to a boil, stirring constantly and add one third of the coconut milk again. Bring to a boil, stirring constantly and add the rest of the coconut milk. Add squash, chickpeas and spinach. Cook for a couple minutes. Serve over rice, garnished with lime juice and zest. To cut down on pots, instead of boiling the squash before hand you can add it directly to the pan after the coconut milk has been added. Cover and cook directly in the sauce until soft, before adding the spinach and chickpeas. Hi Vicky, I was wondering what brand of vegan “fish” sauce you would recommend, and where I might find it? What a beautiful Curry Dish the flavors will be fantastic. Hope you are having a great fall day and thanks so much for sharing this awesome post with Full Plate Thursday. I made this tonight and as I reached into my spice cabinet I discovered I only had Caribbean yellow curry. Even with the substitute it came out wonderful. Thank you for sharing this recipe!!!! Looks so good – shared on my page — http://www.facebook.com/whatvegankidseat.com YUMM!! Oh my gosh, War Heads! I haven’t thought of those in AGES! But I love, love, love a good curry,a nd I agree about the importance of curry paste. Like you, I like them all, and now I am CRAVING a butternut squash curry! My friend is coming to visit soon and she is newly vegan. This will be perfect! Haha yes I haven’t HAD a warhead in ages! Yes high quality curry paste really makes the dish! I am sold when anything is made with curry! I love these flavors! The mix of flavors in this curry sound insanely good, and yes, I do have tamarind in the fridge ~ score! I also love using chickpeas in curry. This is a great and healthy dish. Love the colours and the flavour profile. Yes chickpeas are the best in curry! great work again Vicky! will certainly look into your other work as well. your family must be very happy as they get such delicious dishes to eat. cheers again mate! Such a beautiful vibrant plate! IN Spain, we don’t have Vegan fish sauce or tamari =/ Any other substitutions, or shall I omit it all together? Thanks! If you’re not gluten free regular soy sauce will work. I’m sure you can find that in Spain (I hope)? This was incredibly delicious! I didn’t have the squash so I used sweet potatos. Thanks for the receipe. So happy you enjoyed my recipe April! Sweet potatoes are the perfect substitute for the butternut squash!